There are different ways to teach your dog commands. My preferred method is positive reinforcement or reward based techniques. Usually using food or toys. Anyways, this is a simple but very effective formula of teaching your dog from simple commands like come, sit, down to more complex ones such as go and grab me a drink from the refrigerator. The craving: this is basically finding out what motivates your dog or what does your dog want. Most dogs want food or treats, some dogs want a ball, a toy, a moving object or a tug of war. 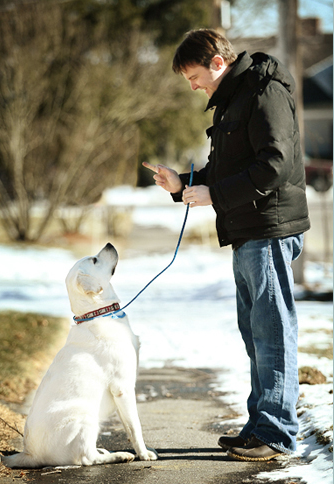 Whatever it is, you’re going to use that craving to get your pups attention and teach him/her certain commands such as sit down, high five etc. If your dog does what you want he or she gets the reward. With repetition it becomes automatic. The command: This is the word you want to use to teach a command. For example: ¨sit¨ or ¨sienta¨ if you want to do it in Spanish. The word or command should go before the cue, but only once you’re good with the cue and you are getting the behavior you’re trying to teach. This way your pup will associate the word with the behavior. Say the command no more than once or maybe twice. The cue: this is the action or movement that you are going to do in order to get the behavior that you are trying to teach your dog. In this part you need to get creative in order to get the behavior you want. Here is an example: if you want your dog to sit down, move your hand with a treat a little bit over his or her head and wait until he or she sits down. Usually that makes the trick. The cue in this case is moving your hand with the treat over your pups head. For different behaviors you’ll have to learn different cues. This is the part where you can either use the help of a professional trainer or learn by trial and error to see what works for your pup. In this step you’re still silent, you don’t have to say the word or command again, you just have to make it happen. The marker: as soon as your pup does what you want him or her to do you say ¨yes¨. You can also use a clicker instead if you are into clicker training. The marker is telling your pup that he or she did what you wanted and the reward is coming. Which is different from the reward is here. What I mean by this is that when you say yes or you click the clicker wait one second and then give the treat. Don’t give it immediately. The marker is not the reward. The marker always comes before the reward. This is important. The reward: Once your dog has done the behavior and you’ve used a marker by saying yes or clicked your clicker simply give him or her the reward. You can also say ¨good boy¨ or ¨good girl¨. Now, be careful using good boy or good girl. The reason why is because in my experience we use ¨good boy¨ or ¨good girl for¨ everything and it becomes completely meaningless to your dog. As a matter of fact good boy or good girl most of the times means excitement. I see more often than not the following sequence: the owner asks for a command. The dog does a beautiful performance. The owner after the dog did the command gets all excited and says GOOD GIRL! And the dog immediately misbehaves by jumping. Why? Because excitement creates excitement and excitement creates jumping. So be mindful with how you reward. With this simple five step formula you can teach your pup pretty much anything. Go and have fun with it!